Yes, I said eggplant balls. Think of these as . . . meatballs without the meat. Vegetarian meatballs? Aubergine croquettes? Balls o’ eggplant? Polpette di melanzane? Whatever you choose to call them, I call them fabulous and this week’s What’s Cooking Wednesday recipe. Yesterday was market day, which, ever since I got back from Sicily and a fabulous plate of Pasta alla Norma, has meant a handful of eggplants coming home with me. I love eggplant balls without any kind of sauce, but you could certainly use a basic tomato sauce as a dip (such as this dipping sauce for fried mozzarella) or even something creamy like perhaps you’d use (although I don’t) for fried zucchini. Also if you want to make them a little fancier, shape them wider and flatter instead of in balls. Either way these are *delicious* and also a great way to hide eggplant in something tasty. 1. Put pot of water on high heat. When water reaches a boil, turn down the heat a bit, cut eggplants in half (and then in half again if you’re using the smaller, fatter eggplants like I do), leaving the skins on, sprinkle a good bit of salt into the water, and then add the eggplant. Let simmer for about 20 minutes or until they are tender. 2. Remove eggplant, drain, and pat dry, letting them cool before chopping them into small cubes, about 1/4 inch in size. 3. Put eggplant in large mixing bowl and add bread crumbs, garlic, cheese, parsley, basil, egg, and salt and mix well. If the mixture is too moist, add more bread crumbs. 4. Shape into balls and then roll balls in breadcrumbs. 5. Heat about 2 tablespoons of olive oil in a large frying pan over medium/high heat. When oil is hot, add eggplant balls one at a time without crowding them. Turn them often with a wooden spoon to make sure all sides get brown, which should take anywhere from 3-6 minutes. Sounds good. Do you serve them as is or with some sauce? I like them as is, but you can definitely either put some sauce on top of them or serve with sauce for dipping. I love eggplant, but never had them this way. Looks very yummy. Britt’s last blog post..Welcome to the Party! Giulia, I can’t tell you how many phrases I had to delete from that post…”make the balls the size you like ’em” was the first to go. Yes, I’ll be 32 this year, why? Yumm, I make these all the time in the summer when I’ve got eggplant coming out my ears and freeze some too. I usually bake the eggplant instead of boiling it though, then I let it cool off, peel it, and run it through the food processor. I like them with tomato sauce on them too, but they’re just as good without. I agree Anno; I definitely think this is a good recipe for those who aren’t crazy about eggplant. Ohh, those look soooo good. And you know I am not a huge fan of the eggplant 😉 It has to be done just right for me. I think I would like these though. Chris actually makes something similar with nuts. They are nut balls. Yeah..I know. I gotta get cookin. I’ll be participating! Nut balls! Hee hee…can’t wait to see what you contribute to the Festa! those look fabulous! my little one would love them. Culinary Cowgirl’s last blog post..Hot, Hot, Hot…Hot Chocolate! *Great* finger food here indeed! These look real good…. big fan of eggplant right here!! Roasted, breaded and pan fried, anyway you make it.. I love it. Great for parties too, so if you still need an appetizer for your BIL’s shindig…. Love eggplant…will be trying these! Tasty, tasty! I wonder if you could add any more/different veggies to this to really pack a veggie pow! Shredded zuchini maybe? Oooh! Yum. I have never heard of eggplant balls. I am sure to try this out. Diane Mandy’s last blog post..I’m a winner! Michelle, These look wonderful!! I want to make them right now! What a great addition to the Festa, and perfect for my next family party! Thank you! This recipe looks great to me. Love Geggie’s idea of veggie balls, too. Thx. Hi – I’ve popped over from Candid Karina’s blog. Just in time for your delicious-looking recipe. I love eggplant and don’t really go for meatballs. This could be the answer to my prayers. So happy to hear it Julia, and thanks for coming over! These eggplant balls just might work! I will bookmark this post and when the eggplant is back in season this summer, I will be prepared! organicsyes’s last blog post..Maple Sugar Time! awesome!! this is an excellent vegetarian option & i’ve 2 more fridays in lent…my repertoire is getting boring so this should be a nice kick! thanks!!! Oh yes, great for Lent! Excellent point 🙂 Enjoy! Wow I’m jealous! Have fun in Italy! Jane’s last blog post..The Tuna is Super Big PLUS a girl dreams Big…. Not a great fan of aubergine but Madam loves it. I hadn’t thought of making balls out of it. 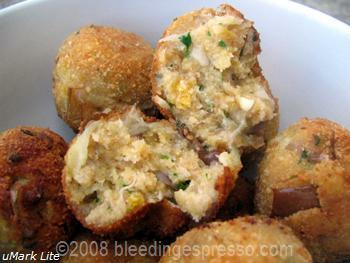 In Cuba they make balls out of ground chickpeas, garlic and parsley which I love…don’t know why I never thought of egg plant. They also make them in Greece (revithokeftedes) but of course add lemon zest and oregano and now that I think of it these are kind of like aubergine falafel. Very interesting. I will definitely give them a whirl. Oh you remind me that these are great with basil inside! I just don’t have any fresh basil right now or I would’ve put it in. In Sicily they make fritters with chickpeas…not sure what else is in them, but they sure are tasty. And yes, I like the aubergine falafel characterization…see, so many names! Looks scrumptious Sognatrice! Yum!!!! Bet these babies are moist in the middle. I am a big fan of eggplant. Hee hee…I’m picturing Pac-Man here after the eggplant dots all lined up in a row…. OMG Michelle, I am so hungry right about now. I have tried so many of your recipes but this one I must do like…….now. I just had a massage, I’m in Telluride Colorado skiing, and my masseuse who I’ve know for years, has just taken on Jessica Seinfeld as a client. She just told me…..I just somehow randomly thought I should tell you since you mentioned her. Da-yum girl! You’re recipes are not inspiring me to keep up with my diet. Anzi, you’re inspiring me to deep fry anything I can get my hands on!!! I can see myself grating fresh parmesan over them and popping them in my mouth. Yummee! Beautiful! Are these a traditional Calabrian dish? Thank you for posting this recipe..can’t wait to try them! Good question Laurie; my guess is that they are somewhat Calabrian in origin (I have seen a recipe for them in a Calabrian cookbook). They are actually basically the insides of the stuffed eggplants that my MIL makes just fried without the eggplant around them…although I’ve never seen her make them this way exactly. Oh those look very yummy! I know you’re not eggplant freaks up there, but you can always try out other veggies…. Never met an eggplant I didn’t like 🙂 Definitely going to try these. My daughter recently started working at an upscale restaurant. While visiting her last week she brought home two tapas each night to share and one night she brought home Japanese eggplant with fresh tomato salsa and romano cheese. OMG it was so good! Let me know what you think Grace! These look delicious! I am going to have to try them. Thanks for the recipe. You’re very welcome Karen; I hope you give them a go! Oh WOW! I’m soooo glad you visited my site. I’m so jealous of YOU living in Italy and I LOVE eggplant. Though I usually mix them with ground beef for something my grandma called Pitzi Utzi! Thanks for inviting me to your blog party. I haven’t made it there yet! ooh, my mom used to try and trick me with these all the time when i was little and didn’t like eggplant! but i knew they weren’t meatballs. michelle @ TNS’s last blog post..Cliffhanger! These look great. And it seems kind of brilliant to take the scrumptious stuffing of something and make polpettini (which I’m sure I spelled wrong) out of them. How do you serve them? They look like they would mix in well with almost any course. These sound devine. Made me really hungry for some. Anything mixed with cheese is good in my book. My oh my but these just sound incredible!! I have NEVER had these, but I would DEFINITELY prefer them to regular old meatballs. These are super easy to make too Cherrye–next week you’re getting eggplants in Soverato! Hah! Now *that’s* a compliment–thanks Jenn! Thank you for this recipe! I love eggplant, and this sounds delicious. 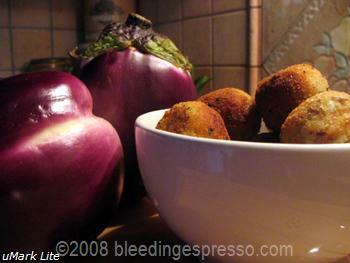 Do you happen to have a Calabrian recipe for baby eggplants stuffed with a cooked potato/eggplant/ bread mixture? It is dipped in eggs and romano cheese and then fried. My in-laws make it, and it is so good, but they can never seem to give me instructions or amounts for the ingrediants so that I can make them myself. We don’t do stuffed eggplants exactly like that, but I think you’ve already found our version. Enjoy! I am looking at your recipes and I love eggplant definitely going to try this one! Do you have a recipe for Arancini? Risotto revisited or arancini tonight anyone? I know I am late to the game on this one, but I just found your blog and then saw some amazing recipes yesterday, including this one. I am also a relatively new “foodie” and learning new ways to cook all the time (I read recipes sometimes and have no idea what’s going on). Anyways, I have always wanted to buy eggplant (ex didn’t care for it) and two weeks in a row, I bought eggplant. However, I didn’t know what to do with them, especially since I don’t have a grill (that’s all I’ve seen done to them before). I tried this sauteed version last week from Mario Batalli and it was okay. I saw this yesterday and was like yes, this is right up my alley. This was such a great recipe. I used low fat regular parmesan cheese and no parsley. The breadcrumb part was delicious. However, I needed more moisture to make the balls. They wouldn’t stick and when I tried to turn them over, they would all fall apart. I think that I will make the eggplant parts either much smaller (those worked for some of them) or maybe chop them up completely to have little chunks in there similar to something like crab cakes. I will also add more moisture. Oh and maybe I will use a smaller eggplant. I ran out of breadcrumbs before I ran out of eggplant. For some reason, I cooked for 4 or 5 people (don’t ask me about my steamed rice) when it was just little ole’ me. I also made this with sauteed shrimp and I must say it was very delicious. Thank you for bringing me a new great recipe that I can try over and over until somewhat perfection!